When we set out in our kayak for a day on the water, how can we better find those fish that have taken to deeper water? Those of us who are experienced anglers know the answer, the challenge that we have is finding the best kayak fish finder available. This short list is simply from our cumulative experience, as it serves as a good “barometer” to get you looking in the right direction. What are my options for mounting the transducer? Some of us use a suction cup, or inside the hull, or through the scupper hole. You will want to check for the type of mount that the transducer comes with, and suction cups are not necessarily the best route. Perhaps it will be one that can be cast out. What are you favorite fishing spots? Are you fishing bodies of water where land is always visible? If you love to fish on open water where land is out of sight, you need a GPS. This is also beneficial for those who like to track their distance and mark certain spots. Are you looking for a more well defined imaging of the fish and structure below? Older technology can show a school of fish as one large image, with CHIRP technology you can position your kayak where the action is with clearer imaging below the surface. Are you interested in placing a marine battery in a waterproof box and running the wires to the transducer and display in your kayak? Or, are you more inclined to go with a portable fish finder pack? 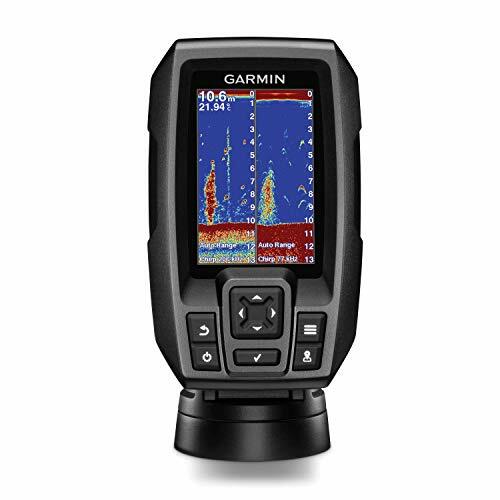 If you are looking for a screen size that is compatible with your kayak, the latest technology CHIRP transducer, and a fish finder with GPS to help you mark your spots, then Garmin has your needs met. Coming in at 3.5 inches, this unit will comfortably fit into your kayak without compromising your available space. All the necessary hardware is included to easily mount the transducer on your kayak. With GPS to assist us in marking our spots, we can be certain to not miss on the hot spots we found previously. Additionally, for those of us who like to venture off far from land, this GPS feature can “lead the way” back home. Sure, you may be accustomed to your standby of years gone by imaging. Have you tried CHIRP technology yet? By sending out a wide range of frequencies, rather than one or two, better imaging results. Regardless of the depth of water, be it shallow or deep, your kayak fishing experience will reap greater returns with clearer imaging of below the surface. If you want to place a marine battery in a waterproof box and wire this Garmin fish finder up, no worries! However, for kayak fishing, Garmin has available a portable pack that is fully inclusive so that all you have to do is carry it onboard and fire it up. 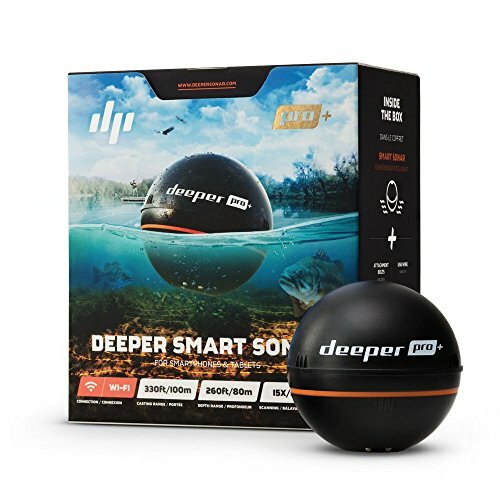 The only item you will need to complement the Deeper Smart Sonar PRO is a smartphone or tablet, and who of us does not have a smartphone these days? By using a WiFi connection, imaging is communicated directly to your phone or tablet. So many of us anglers these days enjoy taking half a day in our kayak and the other half on the bank. Imagine having a fish finder that you can use in both locations. The Deeper can simply be placed on a line and cast out into the water, from your kayak or the bank. No longer will you have to fuss with deciding on where to mount the transducer and wiring up the display to the battery. Just download the Deeper app and enjoy! But wait, you are probably asking yourself how in the world am I going to find a WiFi connection on a lake? No worries, you do not need a WiFi internet connection. This sonar device has an internal WiFi access point that will communicate with your mobile device. Find yourself looking for a budget oriented, portable fish finder? Are you not interested in the latest technological advancements in sonar, and would rather find a basic fish finder for your kayak trips? The operation of this Venterior Portable Fish Finder is simple for a day in the kayak. All you have is 3 easy steps and you can locate the fish. Then you will be able to detect water depth, fish location, and some cover. 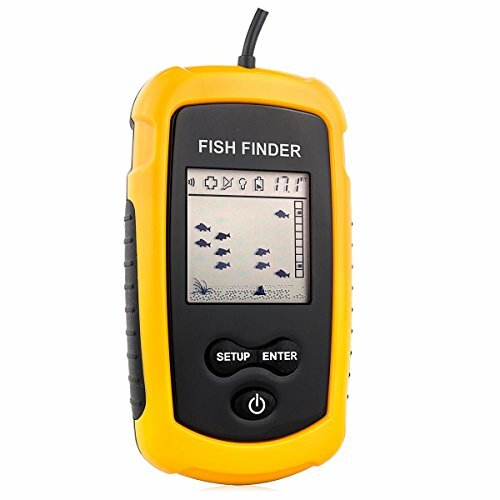 This fish finder also has 5 different settings and is usable on various bodies of water. How difficult is it to find the best fish finder for kayak fishing that is affordable yet efficient? Us anglers know the answer. Inevitably we have to sacrifice some features to spend less, and many times the features we sacrifice are essential ones to a productive day on the water. One of the complaints that some anglers have is the need to constantly adjust the settings to more clearly see fish and structures. This Lowrance model uses Advanced Signal Processing (ASP), which will limit the time you previously spent trying to get a clearer image. Size will not be an issue, as this model is 3 inches. The transducer comes with the necessary mounting hardware, as many customers have successfully mounted this unit on their kayak. Additionally, when looking for the Best Fish Finder for Kayak Fishing, each angler has to decide for themselves what type of technology they need, be it imaging that focuses strictly down or finders that have a “cone” or “side” imaging. 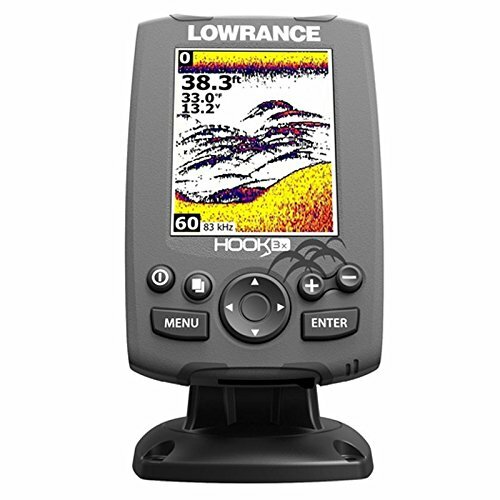 This Lowrance model offers down as well as conical imaging, providing the angler wider ranges of coverage. Are you planning a trip to a river where trout are abundant? A popular method for trout fishing these types of water is using a float, or kayak, and paddling up or downstream for more solitude. 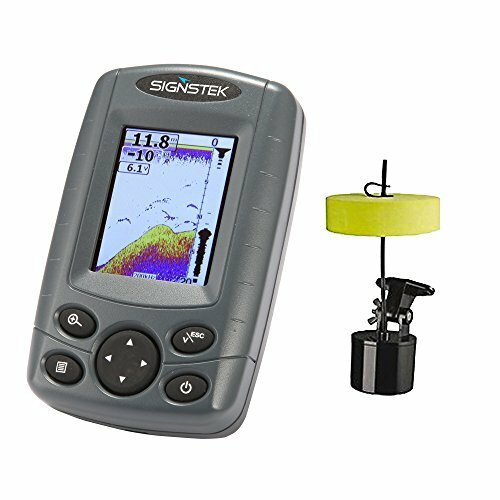 With the Signstek FF-003 Portable Fish Finder in your kayak, you can paddle to where the fish are. No mounting hassles for the display. The transducer can easily be cast into the water, as it comes with a float, or you can mount it to your kayak. Many of us do not want the hassle of placing a marine battery in a waterproof box and setting it up in our kayak for a day on the water. This fish finder is powered by 4 AAA batteries. While the 100 levels of sensitivity settings may concern you, bear in mind that this is to assist the user with clearer imaging. So, we are looking for the Best Kayak Fish Finder. Each of the 5 options listed have their own unique features and benefits. Each of them are small enough in size to work in a kayak. When it comes to the transducer, some of them come with one that can be cast out into the water, while others come with one that should be mounted to the kayak. Our list narrows down when we look at GPS. We know the importance of this feature when we want to mark certain spots that have the coverage our fish of choice prefer, or if we get lost while on the water. Only one of the 5 choices offers CHIRP, as this is the game changer for our decision of which of the 5 is the best. CHIRP technology enables the user to “see” what can not be “seen” with older down and side imaging systems. Finally, the power source. The convenience that comes with a fish finder that is powered by smaller batteries, say AAA’s, is nice. Yet, are you willing to sacrifice quality? Our decision on the Best Kayak Fish Finder is the Garmin 010-01550-00 Striker 4 Built-in GPS Fish Finder. It meets all of our criteria, and is offered in a portable kit for a small amount more. Customers have reviewed this product after use and rate it high. We are convinced it is your best option on this roundup for your kayak fish finding needs.